Susan B. Neuman is a Professor in Educational Studies specializing in early literacy development. Previously, she has served as the U.S. Assistant Secretary of Elementary and Secondary Education. She is especially proud of her work in establishing the Early Reading First program, the Early Childhood Professional Development Education Program, and enhancing accountability efforts to improve children's achievement. At Michigan, she has directed the Center for the Improvement of Early Reading Achievement (CIERA), focusing early childhood policy, curriculum, and early reading instruction, pre-kindergarten - grade 3. Susan is Director of the Michigan Research Program on Ready to Learn, which includes projects all working to change the odds for children in poverty. She received her doctorate at the University of the Pacific in Stockton, California in 1977, her M.A. at California State University, Hayward and her B.A. at American University. Prior to coming to Michigan, she was a Professor at Temple University, the University of Massachusetts, Lowell, and Eastern Connecticut State University. 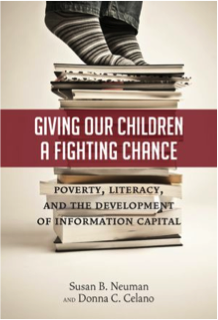 Read more about Susan Neuman and Donna Celano's new book, "Giving Our Children a Fighting Chance". Read Nicholas Kristof's poignant piece in the New York Times. An audio of radio-times is below. Also read the news published on Education Week, Students Must Learn More Words, Say Studies. Giving Our Children A Fighting Chance offers a compelling, eye-opening portrait of two communities in Philadelphia with drastically different economic resources. Over the course of their 10-year investigation—from 1998 to 2009—authors Susan Neuman and Donna Celano came to understand that this disparity between affluence and poverty has created a knowledge gap—far more important than mere achievement scores—with serious implications for students' economic prosperity and social mobility. At the heart of this knowledge gap is the limited ability of students from poor communities to develop information capital. This moving book takes you into the communities in question to meet the students and their families, and by doing so provides powerful insights into the role that literacy can play in giving low-income students a fighting chance. Published by Teachers College Press; 176 pages, $29.95. Find it in the bookstore. For more details about the book, Click here to download a pdf.